Is Your Program Really Free?! Employee Discount Program that is FREE! Here at Connect Your Benefits, the most commonly asked question is, “How Much Does Your Program Cost?” Our favorite answer is to assure anyone interested in offering our employee discount program that it is, in fact, free! 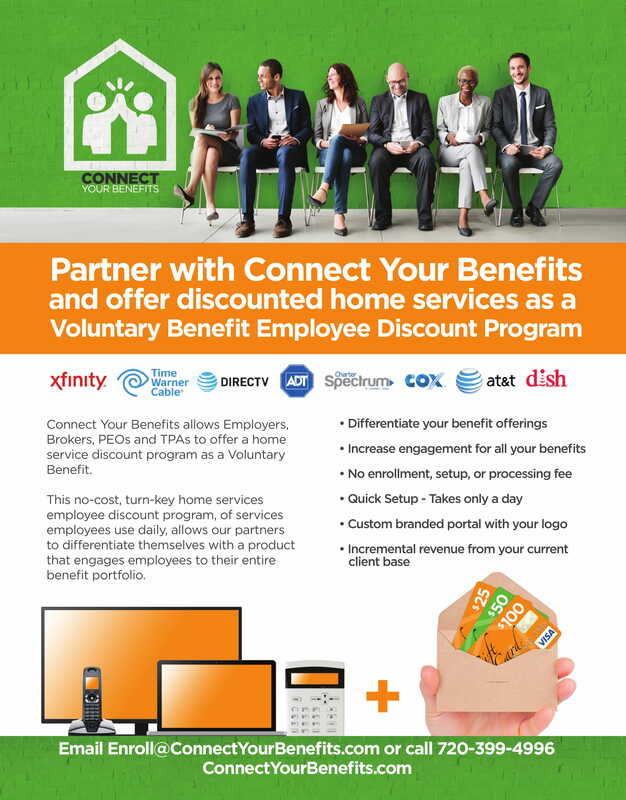 Connect Your Benefits receives discounted offers on Internet, cable and satellite television, home phone service, and home security systems from top service providers like Xfinity, DISH, DIRECTV, Spectrum, and ADT among others. Then, we receive our fees from the service providers every time one of your employees signs up for our services, so we are able to extend our discounts to your members and employees. Connect Your Benefits is proud to offer our discounts to literally anyone. In addition to that, we offer those businesses and membership groups that create a Connect Your Benefits portal ways to qualify for gift card rebates that range between $25-$100. I want Employee Discounts – What’s the Process? If you are interested in receiving discounted rates on services, Connect Your Benefits can provide you and your company with incredible savings, rebate gift cards, and the peace of mind of working with the very best service providers in the nation. In today’s job market, retaining top talent is becoming increasingly difficult. In order to stay competitive, in such an overpopulated market, employers are looking to beef-up their benefits package to help reduce turnover. Traditional benefit offerings generally include a group insurance, retirement benefits, sick leave, vacation, and a few other standards. However, that’s just it, they are becoming “standards” and are no longer wowing possible candidates. That’s where traditional and non-traditional benefits and perks can truly be the winning mix. A 2018 Paychex Pulse of HR survey reported that 33% of HR Professionals say offering competitive benefits is one of the biggest challenges the face, followed by retaining talent. However, we know that non-traditional benefits can cost a pretty penny, but it doesn’t have to! Exploring low-cost benefits that are useful and meaningful to your employees is the key to retaining top talent and reducing strain on your HR department. Connect Your Benefits is a non-traditional, low-cost, employee benefits and perks program that offers meaningful, every day, solutions for your employees. We partner with your organization to deliver exclusive, in-demand, offers from the top home service providers in the U.S.
Another one of our unique offerings is an Employee Wellness Fund that generates income as your employees use our services. The more employees that take advantage of the benefits program, the more we donate to your Employee Wellness Fund. You can cash out your fund at any time for things such as a pizza party, office snacks, a work outing, promotional products, and more! A survey of 1,000 full-time employees reported that employees list free snacks as one of the top job incentives offered. Connect Your Benefits is easy-to-use and enrollment is available all year-round! We pride ourselves on serving more than 35 million employees, across a plethora of industries, nationwide. Interested in adding excitement back into your benefits or corporate perks program? Shoot us an email at [email protected] ! Why Offer an Employee Discount Program? In the ever-changing job market that exists now, many employees can be slightly more decisive when selecting where to work. This is why so many employees have begun to offer an employee discount program as a part of their incentive program. With the introduction of companies like Glassdoor and other job rating companies, it is imperative to keep a good reputation when looking to hire new employees. A solid and diverse employee discount program can help your employees remain happy and satisfied both while at work and when they’re at home. 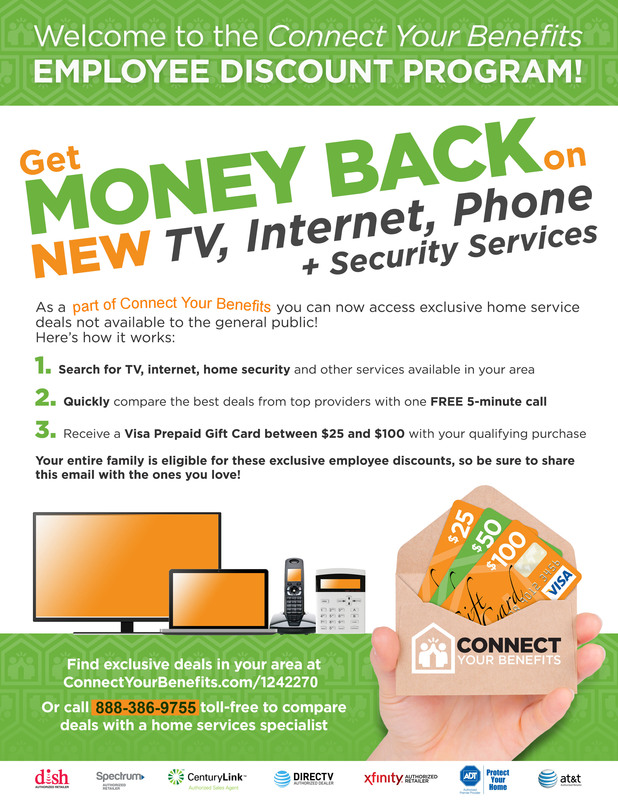 Connect Your Benefits offers discounts and incredible rates for all the members of your company or members group for Internet, home phone, television, and home security. Your employees can gain access to incredible savings from big names like Dish, DIRECTV, Xfinity, AT&T, and more. Find out more by visiting this page and creating an account. If you’ll be at the 2017 SHRM Annual Conference & Exposition from June 18-21, you’ll definitely want to see what’s going on at Booth 3041! Not only will we be giving away solid gold coins to four lucky winners (more on that later), but we’re relaunching our Employee Discount Program, an easy-to-use rewards plan that offers your employees exclusive deals on home services they can’t get anywhere else. Why is the new and improved Employee Discount Program right for your organization? Enter to Win a Solid Gold Coin! If you stop by Booth 3041 during the conference, you’ll have a chance each day to win a 1/10th-ounce gold coin. You can also enter to win a ¼-ounce gold coin if you enroll your company in the Employee Discount Program during the conference. Have questions or ready to get started today? Give us a call at 720-399-4996 or enroll online! Even if you’re not attending the conference this year, you can still enroll in the Employee Discount Program anytime. And whether you’re going to be at the SHRM conference or not, you can follow and interact with Connect Your Benefits on social media, as we’ll be actively posting during the conference. Our Twitter handle is @BenefitsForHome, and our LinkedIn company page is at https://www.linkedin.com/company/connect-your-benefits. How are companies like Disney & IBM revolutionizing voluntary benefits? What do Disney, Microsoft and IBM all have in common besides being some of the world’s most recognizable brands? According to HR industry veteran Rob J. Thurston and Connect Your Benefits President Matt Gabrielson, these three companies are at the forefront of a major shift in deciding which voluntary benefits to offer employees. Thurston and Gabrielson collaborated on a brand-new article titled “IBM, Disney and Microsoft’s Impact on Voluntary Benefits,” in which they explore how organizations are realizing that employees want benefits that are useful in their daily lives (especially home services). You can read the article for free at CorporateWellnessMagazine.com or read it in the upcoming November 2016 print edition of Corporate Wellness Magazine. Want to learn how you can add your organization to the growing list of those featuring home service discounts in their voluntary benefits packages? Visit our Home Service Benefits page to learn about the home service discount programs available to employers, associations, TPAs, PEOs and brokers!